Ride picturesque dirt trails along the rocky coast of Great Chebeague Island. Get 6 months to pay $470.00 with PayPal Credit! No payments + no interest if paid in full in 6 months. 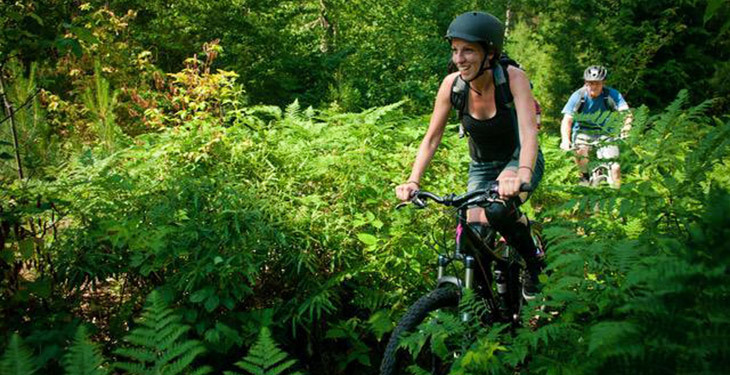 This exciting mountain biking adventure will have you exploring both the mountains and the sea. 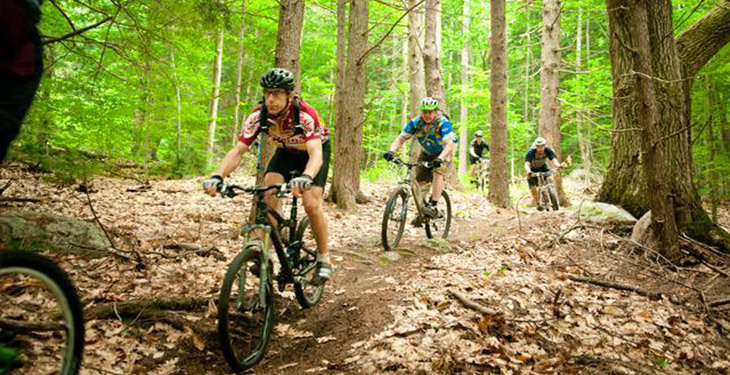 Explore the "Island of Many Springs," as you mountain bike through Maine's lush forests. You'll enjoy a serene day trip to the island, bookended by trail riding in the mountains with expert guiding, instruction, and equipment on this 4-day adventure. Your accommodations options include a yurt, lodge, or camping an hour away from the ferry location to Great Chebeague. The lodge has even been known to host the occasional concert/singer songwriter, so you never know what you'll find! On arrival, you'll be fitted for a bike and all necessary equipment as well as expert instruction if desired. Take in the gorgeous views of Great Chebeague, bike through lush forests and along sandbars, and partake in a lobster and seafood feast on this incredible adventure! Arrive Thursday anytime after 4:00 pm and get settled in. 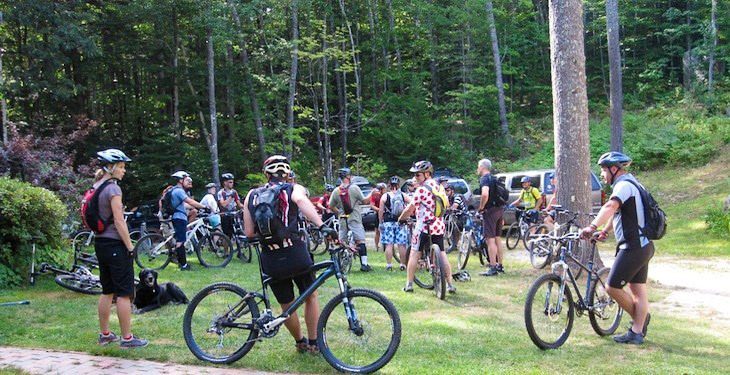 Meet the crew and other guests, get comfortable with your accommodations, check out the trail maps, and if time permits, you'll be fitted to a bike. After a delicious breakfast you'll finish your bike fitting, receive instruction if desired, then take a guided trail ride. After a lunch break at the lodge you have the option to hit the trails again or sit back and enjoy the mountains. There are kayaks available for exploring, or you can get lost in a good book. 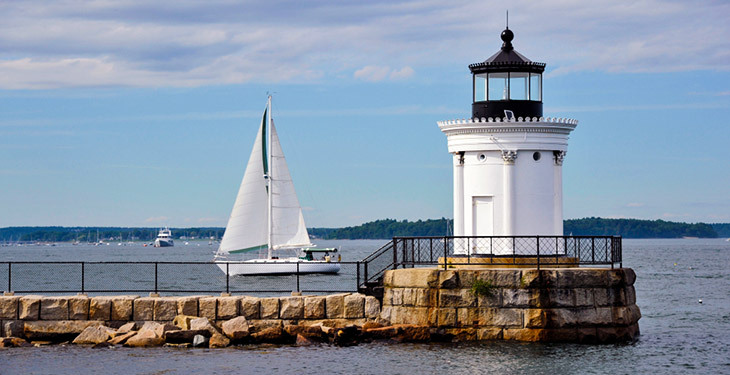 Transfer to Portland, Maine (1 hour drive) and hop on the Casco Bay ferry with your bikes. 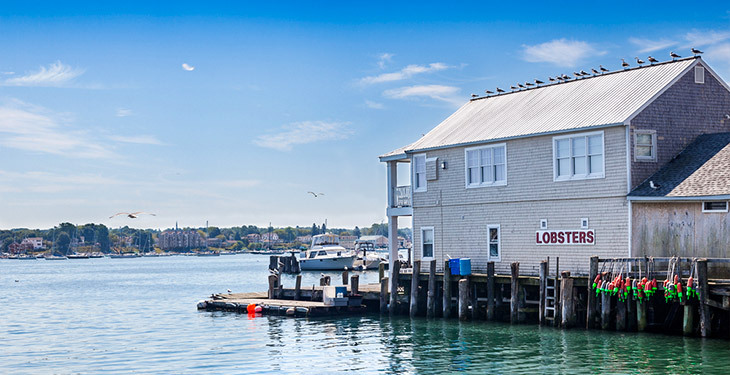 The boat will depart from Portland around 10:00 am, cruising by some of the Calendar Islands of Casco Bay before debarking on the more remote island of Great Chebeague. Ride along the very quiet island roads and trails for the day and enjoy gorgeous vistas and scenic overlooks. You'll have lunch on Chebeague and when the tide is out, you'll hike and bike over to Little Chebeague Island and explore those trails. Return to the wharf to meet the 4:15 pm ferry back to the mainland. Once back in Portland, carpool a short distance to Cape Elizabeth, to the famous Lobster Shack at Two Lights Park on the ocean. Here you'll enjoy a lobster and seafood feast! Afterwards, caravan back to the mountain lodge or stay and take in the picturesque Old Port area of Portland before returning. Enjoy breakfast at the lodge and one last guided ride in the morning before packing up for your 1:00 pm departure. 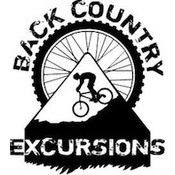 I just spent the best weekend ever at the Mountain Bike & Microbrew Festival with Back Country Excursions. I love bikes, beer, and the outdoors, so this was perfect for me. Of course, anyone expecting a luxury resort would be sorely disappointed, but I would say mountain biking is not for those with delicate constitutions anyway. After this trip I look like I was brutally beaten by very short people: nothing but scrapes and bruises from the hips down. I bike around the city a lot but I've never tried single track before this trip, and now I may be hooked. Cliff was really great at laying out the basics for us before getting started, and the rides were divided up by skill level and speed. The guides were different degrees of awesome (Kevin was my favorite). The food was awesome and plentiful, as was the beer. Everyone (guests and staff alike) had a great attitude, and I had a great time. I highly recommend this place to anyone looking for a fun little adventure. My only regret is that I didn't get to see a moose. Went with a friend for a day ride. My friend is newer to mountain biking and I have been riding for a few years. Cliff, Tyler, and Lynn were excellent hosts. We rode parts of the thirty miles of very thoughtfully designed single track in the morning for about 2 to 2.5 hours. Lots of good ups, downs, just the right amount of cornering, minimal roots for New England riding, and just very good flow. The degree of how well designed the trails are is hard to articulate. I was continually impressed the more track we covered. We returned to the lodge for lunch. Cliff cooked us up homemade burritos with numerous vegetables from their on-site organic garden. A great lunch break with outstanding food. Cliff took us on a tour of the property, which is incredibly interesting as they are very well designed off the grid homes and an enormous amount of self built features. The on-site yurt is a stone's throw from the lodge and garden. It's a large structure that could hold about 10. 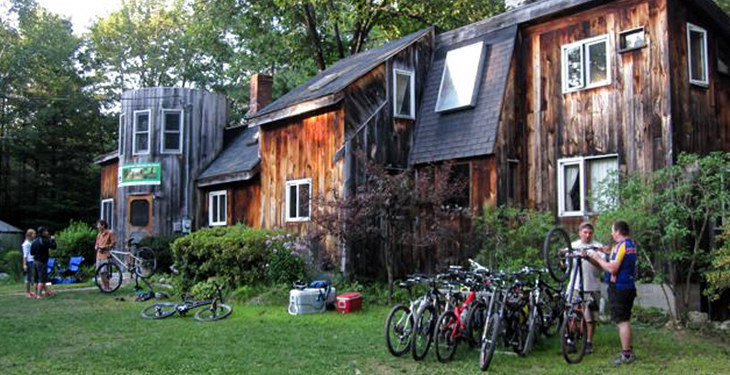 The lodge is an amazing rustic house turned lodge that seems to suit the needs of the property perfectly. We headed out for the afternoon and rode another hour and a half of great quality trails. Cliff and Tyler were great at teaching us mountain biking techniques, both at their fun park with features right by the lodge (jumps, side wall, narrow bridges) as well as teaching us while riding. Really glad we went. Please note there is a minimum of 5 participants required in order to guarantee each departure. Please wait until you receive confirmation from Back Country Excursions before making any travel arrangements. There is a 5 person minimum per departure date. Please wait to make travel arrangements until you have received confirmation from Back Country Excursions. 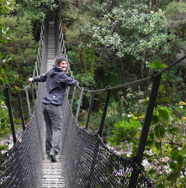 This trip offers three options, based on availability. Please note accommodations are first come, first serve. There are a limited number of rooms available in the lodge. There is also a yurt that's popular for group use (sleeping bags recommended), or you can camp (full facilities). Single rooms can often be accommodated, especially with advance notice. There is no extra charge. All prepared meals are homemade and never out of a box or can. Favorites are chili, fresh cornbread, salads, black bean and veggie burritos, muffins, granola, waffles, pancakes, and of course, maple syrup from Maine. Plan to budget money for meals not included in the trip (see itinerary) and for local beer or wine at the lodge. You'll be provided a suggested packing list by the operator upon booking. However, plan to bring a light wind breaker, layers, small backpack or fanny pack, sneakers or trail running shoes, biking shorts, fast drying tops (long sleeve and short sleeve), and tights.